We would like to share with all of you some news coming out of a school in Southwest Germany. Ninth-grade students from this school have sent us a project on which they were working on for a long time. This project was centered around Tenerife, and Loro Parque as the main attraction on the island. We are very pleased to know that our message is reaching everyone, and that they see us as an example of modern zoo. We would like to thank all students and their teachers for having made a great effort on this excellent work. This gives us motivation to keep on in our work for the care and protection of animals. Today we are celebrating Halloween with a very special present for the animals who live in Loro Parque: their favorite food in eye-catching and intriguing pumpkins, which surprise both the park inhabitants and the visitors. This tasty decor has been placed in our exhibitions of the titi monkeys, gorillas, chimpanzees and meerkats, where the animals are being surprised with a feast while carefully discovering the carved figures in each pumpkin. With this type of activities, the keepers of the park broaden the specific environmental enrichment programs for each species in a playful way, as usual. Although Halloween is from the Celtic culture, it is celebrated throughout the Anglo-Saxos countries and, recently, in other countries like Spain. We have decided to share this special day with the visitors, so they can discover the behavior of the animals with this experience that gives them new sensory stimuli. An opportunity to enjoy the best Halloween at the Embassy of the Wild Animals with no “trick or treat”. 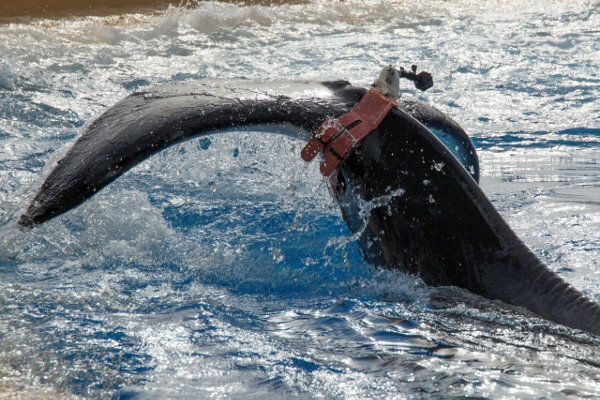 The interesting studies that are carried out at the prestigious Max-Planck-Institute, which has an investigation centre at Animal Embassy in Loro Parque and collaborates in research with Loro Parque Fundación. We wish to calm all the people worried about Morgan and therefore, share these images with you. You can see that Morgan is doing perfectly well. Morgan does not have any health problem and she certainly hasn’t tried to kill herself as some, apparent “animal lovers” like to put it. They only affirm their ignorance with these kind of statements. Today, as on all other days, Morgan is doing well swimming with the rest of the group. From Loro Parque, we want to share the emotional inauguration of the amazing Aviaries of South America, as well as the new home of our adorable Red Panda couple. We have prepared a short video of this very special day.